It is cold. I don’t really know how I feel about this change in weather lol. With the change in weather, I’ve been feeling the changes in my skin as well. My face and body have been feeling dryer than usual. Now it’s time to move into winter hydration mode. Here are a few ways I keep my skin hydrated in the winter. WATER: First and foremost, if I don’t drink enough water I can feel it in my skin. We all know we are made up of a lot of water, and we have to replenish ourselves with hydration daily. I have a tendency to not drink as much water as I should when it starts to get colder outside. 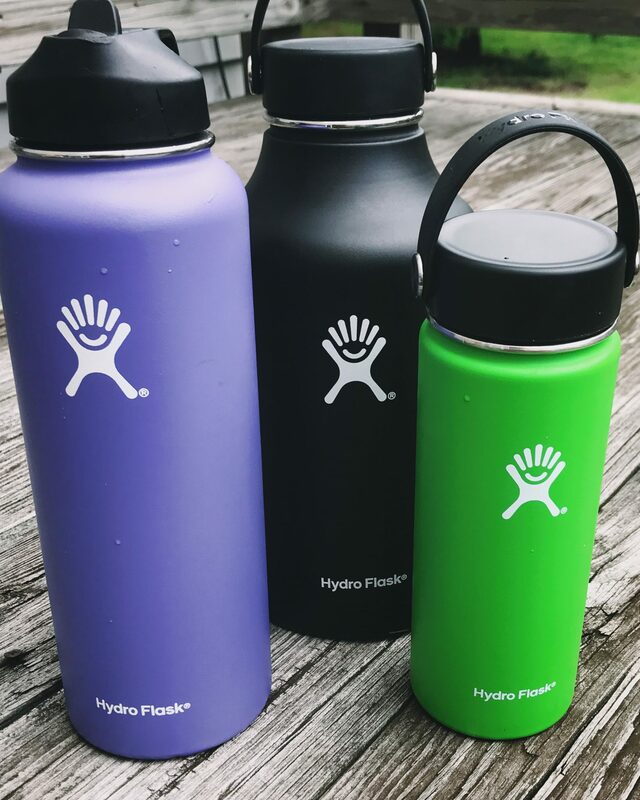 My favorite water bottle is the hydro flask it’s amazing because it keeps your liquids hot or cold. I make a smoothie at night and in the morning it is still in its perfect smoothing consistency. MOISTURIZE: I use a thicker cream in the winter and a mistrusting body wash to keep my skin as hydrated as possible. Currently, I am using a really thick cream in the evening. Here is the cream I’ve been loving lately, it works great for face and body. What are some of your skin concerns in the winter? How do you combat them? Share with us in the comments. How fun is this casual outfit? I love how this looks — gives you a splash of spring. Over the last week or so, the United States has been frozen. 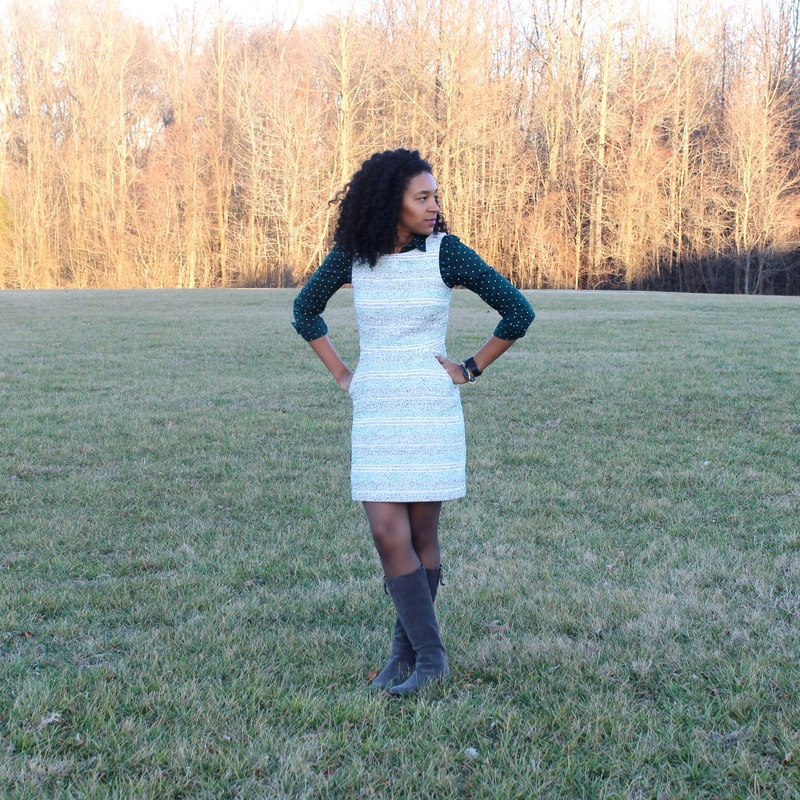 The vest gives an extra layer of warmth, and the bright mint sweater is a great color that reminds me that spring will come… eventually. One thing I like to do for added spice to my outfits is to add a contrasting pop of color. 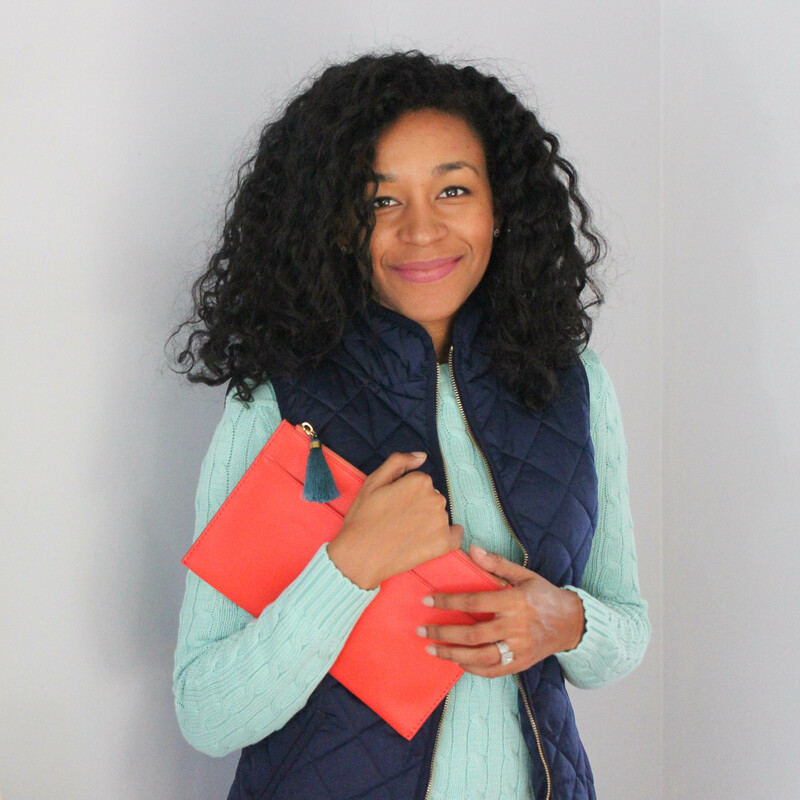 The clutch adds just enough fun to this look. I like a classic look but I like to add something different to make a classy look unique. I feel the need to rant about how cold it has been the last couple of days. I guess I should be thankful that it is not snowing, so I guess I shouldn’t complain so much. With this cold weather, I have been living in this coat. Honestly, I wear it everywhere, everyday, all the time. I wanted this coat so bad because I have been into the athleisure look and wearing this with sneakers is my favorite look, especially for the weekend. I received this coat for Christmas, but if you are looking for a similar coat I found one here and here. When I planned this outfit, I was going for a simple casual Valentine’s Day look. Once I saw the pictures I noticed that this would be a great outfit to wear to work, if you want to be festive on Valentine’s Day. Do you all do that? Sometimes it brings a little fun to what can be a monotonous work day. I am sure I’ve expressed how much I love leopard, it goes with everything and is hands down my favorite print. 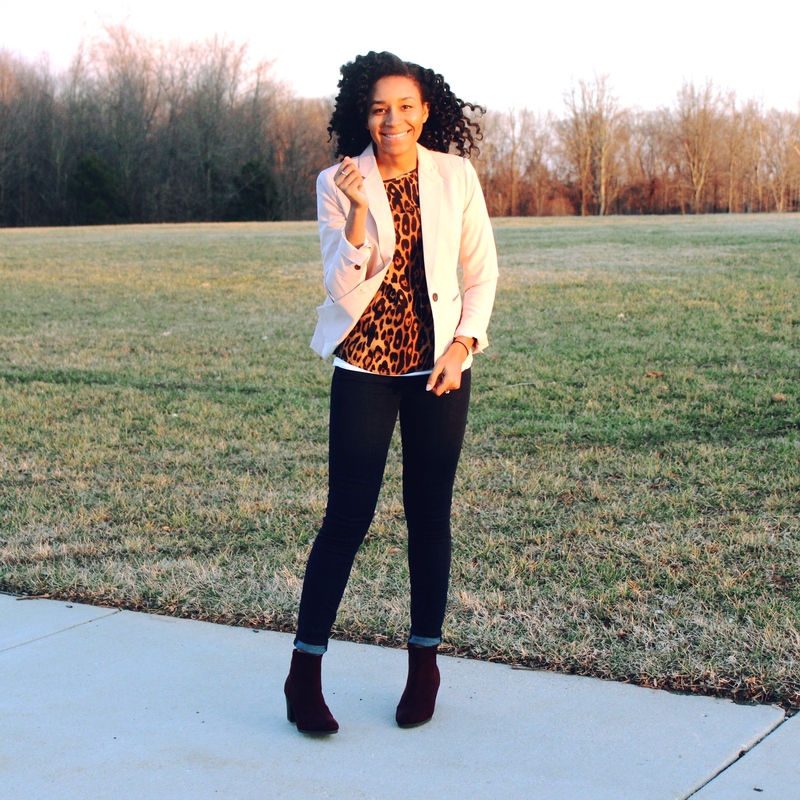 These are my favorite jeans, and I found this blazer at TJ Maxx. This shirt was given to me by my little brother for Christmas, from The Limited which is no longer with us 🙁 I am sad about them going out of business, but glad I got this cute shirt at an amazing price! Today’s outfit is a simple one. I love love love outfits that you can just throw on and still feel like you are in your pjs. Typically, I prefer a more structured looked and when I found these pants until I walked out the house for this shoot I was unsure about these pants. I decided to take a risk. Can you tell I am not much of a risk taker? When I decided to wear these pants I though to myself They are cute they look great with this shirt and decided to go with it. I had to remind myself, it is just clothes and fashion is meant to be fun and creative so lets plan and have fun with it. I have another outfit suitable for a business casual look. So for you who work a 9-5 this is perfect for you. Funny story about this outfit, I actually wore it on my graduation day. Back in December I graduated with my Master’s degree, it was freezing outside and I know I didn’t want to wear heels so this is what I came up with. I was comfortable all day. I found this dress on the sale rack at Banana Republic. I love their dresses, they are the most comfortable, never to short and cute for business attire. I hope you all have an amazing weekend, I would love to hear all about it. Leave me a comment letting me know what you are doing. Can you believe we are almost half way through winter? I am getting so excited to be able to start shopping for spring clothes. Fun fact.. I love spring. 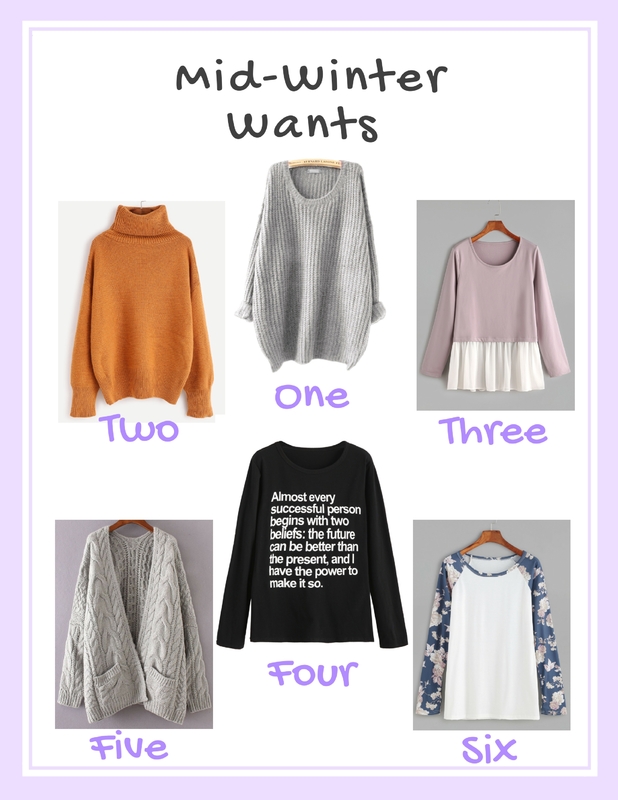 I am holding out as long as I can to start purchasing spring items. Okay, now that we have gotten my favorite season out of the way. Here are some picks I plan to purchase form this site. I really need to focus on bottoms, but it is almost impossible for me to purchase pants online, that normally is a special trip that needs to be made to the mall, which I plan to do soon. Anyway, if you are in the need for some mid season updates I suggest you check out Shein. They have really trendy outfits that are at an amazing price!!! Let me know if you all make a purchase, I would love to see what you get!!! Happy Tuesday Friends, today I wanted to talk with you all about my favorite pair of jeans. First let me say, I don’t have a lot of jeans. Actually, I hate jeans. I have never found them to be comfortable, I’ve been on the search for the perfect pair of jeans for years, and have never found them… until now. When I was younger, everything was too short, now I have to find something that flatters my legs. I have found a pair of jeans that are comfortable. Sometimes, I even reach for them first when I am preparing an outfit (which never happens). I am sure you all have seen them a million times, but it is because I love them. Enough about how much I love these jeans. You will never believe, they are from the Gap. I have been a lover of the Gap for years but never purchased jeans from there. Until now! I love them because they are a higher waist, are a solid color, long enough. In my opinion I photography sort of short, but I am actually 5’8″. Let me know if here are any jeans you would recommend. I am actually looking to purchase another pair and before I buy another pair of these jeans I would like to see what is out there. I hope you all had a great weekend!!! !